Saline River - The principal tributary of the Smoky Hill River, its source is in the southwestern part of Thomas County. For the first 60 miles its general course is almost due east across the southern part of Thomas and Sheridan Counties. It then turns slightly to the south, continuing a general eastward course, however, across the northern part of Graham and Ellis Counties; then across Russell County a little north of the center; eastward through Lincoln County; across the southwest corner of Ottawa, where it turns sharply to the southeast and empties into the Smoky Hill River a few miles below the city of Salina, Kansas. The total length of the stream is about 250 miles. Salt Fork of the Arkansas River - A tributary of the Arkansas River, the waterway, located in southern and northern Oklahoma has been known by various names in the past, including Grand Sabine River, Grand Saline River, Little Arkansas River, Red Fork of the Arkansas River, and several other names. Dam across the Saline River, Lincoln, Kansas, early 1900's. The approximately 192 mile long waterway rises in Comanche County, , and flows initially southeastwardly through Barber County, , into Woods County, Oklahoma, where it turns eastwardly for the remainder of its course through Alfalfa, Grant, Kay and Noble Counties in Oklahoma It flows into the Arkansas River in southern Kay County, about seven miles south of Ponca City, Oklahoma. In Alfalfa County, Oklahoma a dam on the river maintains the Great Salt Plains Lake, which is lined with salt flats and is the site of Great Salt Plains National Wildlife Refuge and a state park. The Salt Fork's largest tributaries are the Medicine Lodge River, which joins it in Alfalfa County and the Chikaskia River, which joins it in Kay County, Oklahoma. Smoky Hill River - The Indians supposed this stream to be the Kansas River, and by some of the early historians it was also considered as such. 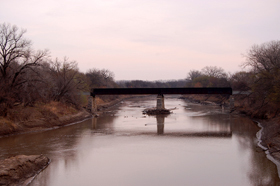 Probably the first mention of it was by the explorer Zebulon Pike, who encountered it on September 4, 1806, while on his way to the Pawnee village, and called it the main south branch of the Kansas River. 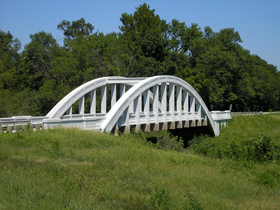 The river's name comes from the hills near Lindsborg known as the Smoky Hills. The Smoky Hill River has two main branches, both of which rise in Colorado. The north fork enters near the southwest corner of Sherman County, flows about 25 miles to the east, then makes a turn to the southeast, cutting across the extreme northeast corner of Wallace into Logan County. The south fork is formed by two branches which rise in Kit Carson and Cheyenne Counties, of Colorado, about 40 from the Kansas line. This branch flows in a general easterly direction, enters Kansas about the center of the west line of Wallace County and flows almost due east through that county to unite with the north branch at a point about six miles west of Russell Spring. The course of the main stream from this point is almost due east through the counties of Logan, Gove, Trego, Ellis, Russell and into Ellsworth, where it bears to the southeast, making a turn and entering McPherson County. 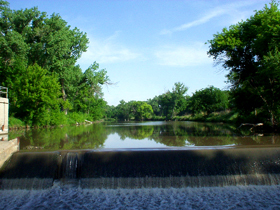 The river here makes a sharp curve to the north and enters Saline County, flowing as far north as the town of Salina and deviating slightly to northeast, passing through Dickinson and Geary Counties, where it unites with the Republican River to form the Kansas River. Zebulon Pike mentioned that the river was navigable in times of flood, but there is no record of its having been navigated other than by the steamboat Excel for one trip in 1854, and by the Gus Linn in 1859, the latter taking a whole day for a round trip between Fort Riley and Junction City. The estimated length of the river is about 400 miles. Solomon River - Once also known as the Nepaholla River, it is formed by two branches -- the north and south, both of which rise in Thomas County, , within ten miles of each other. For the first ten miles, the branches flow almost parallel to each other at a distance of not over 4-5 miles. The north branch flows in a northeasterly direction through Thomas County, the northwest corner of Sheridan County, the extreme southeast corner of Decatur County, the southern portion of Norton and Phillips, the southwest corner of Smith and the northeast corner of Osborne and into Mitchell Counties. The south fork flows almost due east through the counties of Thomas, Sheridan, Graham, Rooks and Osborne and unites with the other branch about two miles east of the west line of Mitchell County. The main stream then makes a bend to the southeast across Mitchell, the southwest part of Cloud, across Ottawa and the extreme northeast corner of Saline County, where it unites with the Smoky Hill River near the town of Solomon. Including its branches the Solomon is about 300 miles long, has a number of small affluents and waters one of the prettiest sections of the state, approximately 6,000 square miles in extent. Though the exact location is unknown, but thought to be near Penokee, in Graham County, the Battle of Solomon Fork took place along the river in July, 1857. Between 1863 and 1864, European pioneers settled the area around the river and Fort Solomon was located on the east side of the Solomon River. The legislature of 1864 declared the river unnavigable, although there is no history of its ever having been considered so. One of the first all African-American settlements, Nicodemus, is near the Solomon River and today is preserved as the Nicodemus National Historic Site. Spring River - Situated in southeastern , southwestern Missouri, and northeastern Oklahoma, the river begins in northern Barry County, Missouri south of Aurora. It travels north of Verona and turns west across Lawrence and Jasper Counties, passing through Carthage, before snaking its way into Cherokee County, Kansas where it widens considerably. It then flows past the east sides of Riverton and Baxter Springs before emptying into the Grand Lake o' the Cherokees in Ottawa County, Oklahoma. The river takes its name from the many springs that provide its beginning, including Big Spring in Lawrence County, which discharges 12.3 million gallons of water per day. The river forms the western boundary of the Ozarks in southwest Missouri and southeast . The river was important to settlers in Lawrence and Jasper Counties of Missouri in the 19th century, especially around Carthage. Numerous grist and saw mills were established on the river as early as the 1840s. 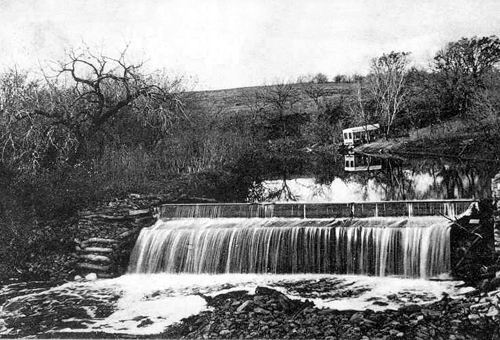 A dam erected northeast of Carthage in 1875 provided water power to mills and other industries. This image available for photographic prints and downloads HERE!